After returning from a long bicycle trip along the Pamir Highway though the Pamir Mountains in Tajikistan, where neighbouring glaciers and strong winds can make for chilly nights, I realized just how important it is to have a good sleeping bag. For my next cycling trip, I knew I needed something lightweight, warm and durable. 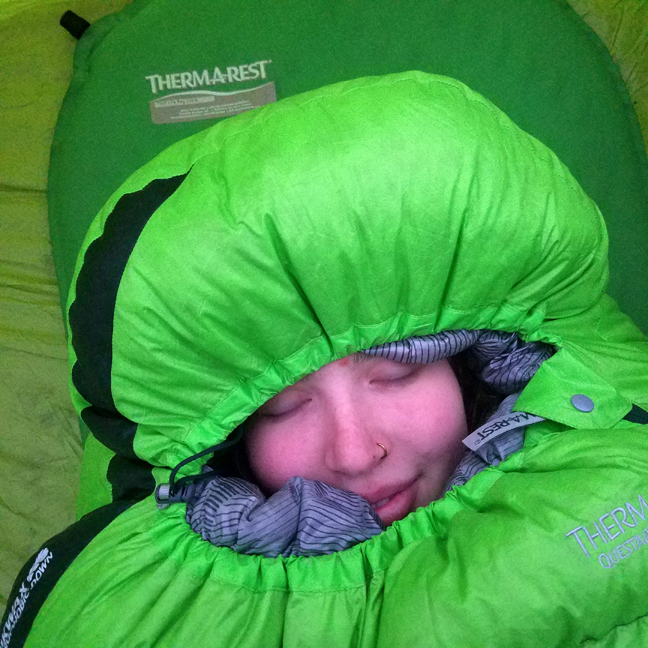 Enter the Therm-a-Rest Questar HD sleeping bag. The first thing I noticed about the Questar HD is the care that was put into the production of this sleeping bag, and as I looked further into Therm-a-Rest products, I also saw that the company makes an effort to be socially responsible — two major selling points for me. (For example, Therm-a-Rest sleeping bags only contain feathers from non-living birds.) I decided to put the sleeping bag to the test this past winter near my parents' home in Ontario. The Questar HD model is a three-season bag with a temperature comfort range of 0 C (with a limit of -6 C). It performs exceptionally well in wet weather, too: the water resistant NIXWAX 650+ down filling dries 70 per cent faster than non-treated down, maintaining the loft and insulation qualities that keep you warm. The waterproofing applied to the exterior of the sleeping bag is water-based and free of harmful fluorocarbons. If you are a person who tends to sleep cold, this is the perfect sleeping bag for you. Heat reflective fabric on the interior and along its zippers seals in body heat. 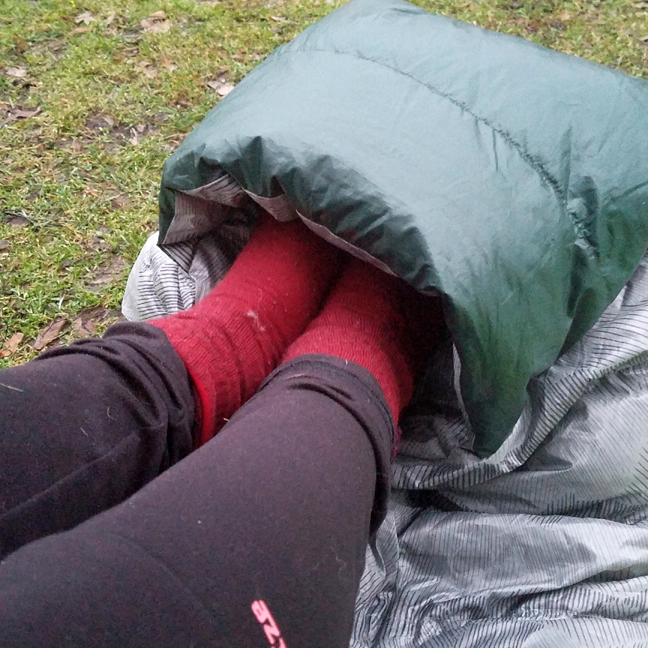 A special pouch located at the bottom of the sleeping bag cocoons your feet to keep them toasty warm, a feature that’s particularly important on really cold nights. Generally, people lose most of their body heat through their heads, so the Questar HD features a well-constructed drawstring at the top of the sleeping bag that cinches snugly around your face, leaving just your chin and nose uncovered to maximize heat retention. At just over one kilogram for the regular size (only 920 grams for the small size) and a compressed size of a tiny 23 centimetres by 36 centimetres, this sleeping bag is great for hikers and bikers as it can easily clip onto a backpack. When at home, you can transfer it to a bigger bag, which conveniently comes with the product. This well-intentioned inclusion helps the feathers keep their loft for as long as possible while you wait for your next adventure. To air it out from time to time, the tear-resistant bag has a handful of cloth-tabs from which to hang it. 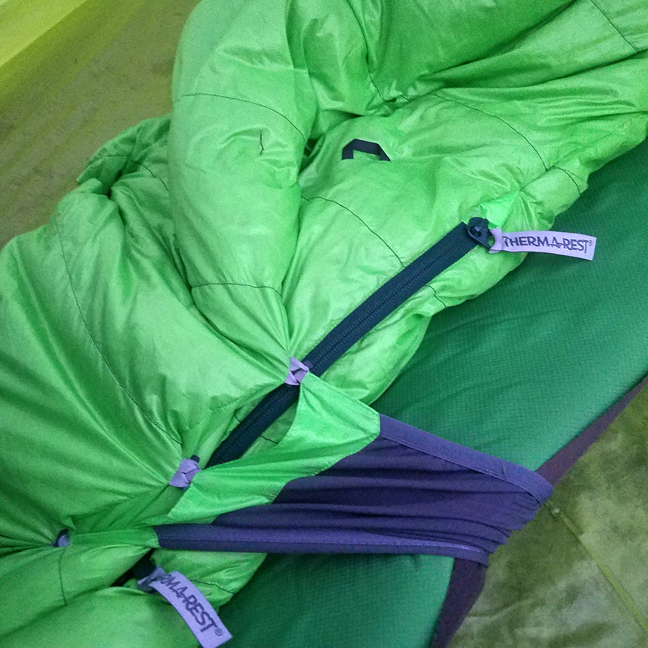 The Questar HD's handy SynergyLink feature allows you to connect the sleeping bag to an insulated mat, helping to ensure you don’t wake up on a chilly tent floor by morning. If you don't like the notion of being tethered to a sleep mat, then you can simply remove the connectors by undoing three button fasteners. Located on the outside of the sleeping bag is another nice detail: a small concealed zip pocket, for storing money or small valuables. In all, this truly is a lightweight and warm sleeping bag at a reasonable price. It has some new and considerate innovations and an overall convincing quality and durability. On my next bicycle trip, this bag will be my choice to stay Therm-a-Rested.